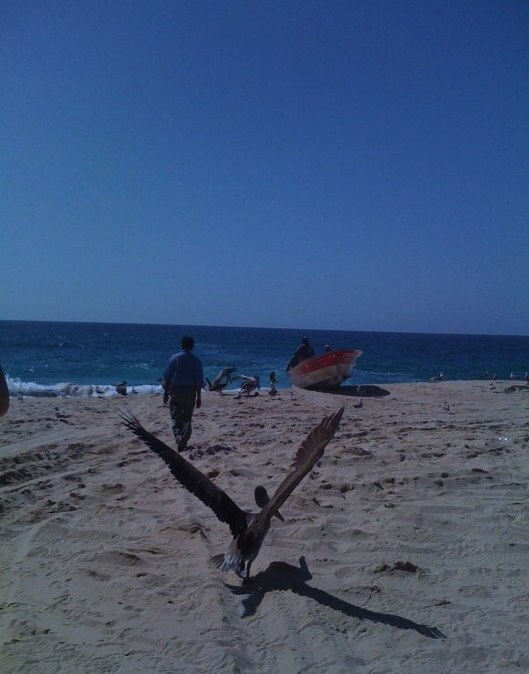 In December 2006, I was on a family vacation in Cabo San Lucas and we took a day trip up to Todos Santos. We instantly fell in love with the little town and I was head over heels for the new guy I had just met there (who later became my husband). I began visiting Todos Santos on a regular basis (we were dating long distance – he was in Mexico, I was in California) and was quickly enchanted by life in Todos Santos. With its slower pace, colonial facades and small town charm, it felt more like authentic Mexico than the other more popular destinations in Mexico I had visited before (Cabo San Lucas, Cancun, Mazatlan, etc.) We are now lucky enough to call Todos Santos home and we have just turned our house into a boutique hotel – Villa Santa Cruz. Here are a few thoughts about the feel of Todos Santos, as compared to American cities and other more popular Mexican destinations, and why it should jump to the top of your list as your next vacation:1. The beaches are empty. Visiting the beaches in the US can often be more of a hassle than its worth. I remember when we were living in Palo Alto, California, we’d drive over the mountains to the beach to escape the heat in the valley. But, after spending 2 hours in traffic, parking miles away from the beach, and putting $20 worth of quarters into the meter, we were not exactly thrilled when we finally made it to the sand and could barely find an empty spot to put our towels. This is often the experience I’ve had visiting Cancun and Cabo San Lucas as well – just too many people and too much noise (said at the expense of sounding like an old lady). photo: La Pastora Beach Here, in Todos Santos, you can walk on La Pastora beach, right in front of our hotel, and not see another person for the whole day. It is a beautiful, wide, white sandy beach that you share with some seagulls and an occasional sea lion. The same is true for Las Palmas beach just south of Todos Santos, which has the added bonus of being surrounded by a lush palm orchard. While the San Pedrito and Cerritos beaches have a few more surfers and sunbathers, you’ll never feel part of a crowd. 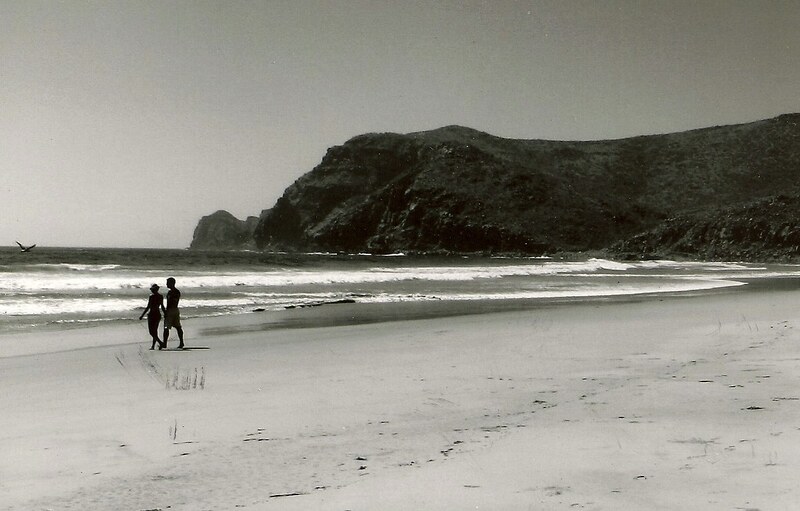 photo: Las Palmas Beach 2. Delicious Restaurants. For a small town, Todos Santos is blessed with a wide variety of delicious restaurants. One of our favorites is Michael’s at the Gallery, serving sophisticated Asian fusion dishes in a romantic garden setting. We love the gas fire lights and night blooming jasmine. For authentic Mexican dishes, we highly recommend Landi’s at the Todos Santos Inn. With affordable prices and live music a few nights a week, her restaurant is always fun, full of people, and is a true taste of Mexico. photo: Fisherman's house in Todos Santos 3. You know where your food comes from – great for vacation rentals. While it is true that the local and organic food movement is gaining popularity in American towns (thanks to Barbara Kingsolver’s Animal, Vegetable, Miracle), many people still depend on large grocery chains for the majority of their food. This food is shipped in from around the globe, not only increasing its carbon footprint, but also putting a bit too much mystery into where your food actually comes from and how it was raised and handled. 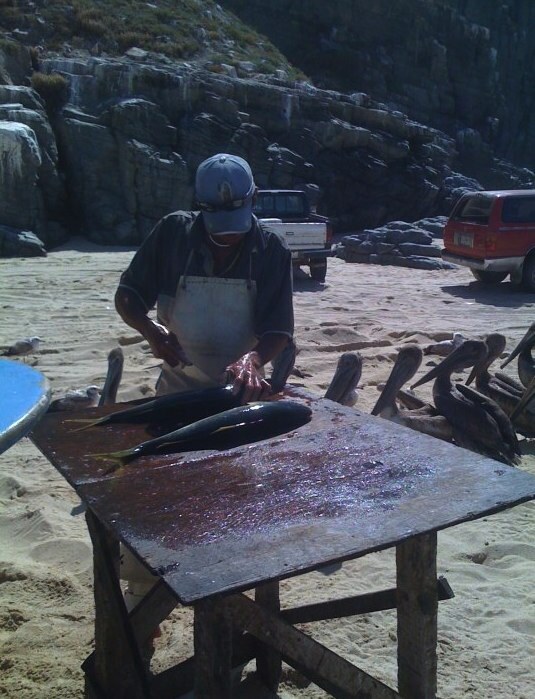 photo: Fisherman in Punta Lobo In Todos Santos, you know where your food comes from. If you’ve rented any of the incredible homes listed on www.VRBO.com in Todos Santos, the grocery options will make you want to stay home and cook. 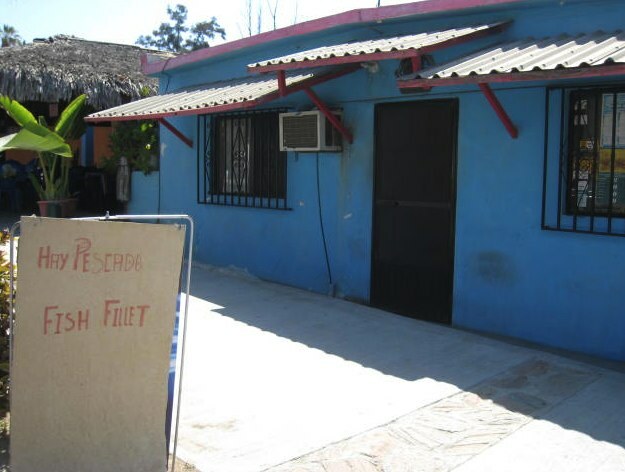 You can buy fresh fish from a local’s blue house in town at ridiculously cheap prices (about 5 dollars for 2 pounds of fish) or straight from the fishermen at the beach at Punta Lobo. You can be assured that it was swimming either the day before or even just that morning in the ocean in Todos Santos. In fact, you can see the fisherman in panga boats or shore fishing from right in front of our hotel. Additionally, you can buy fresh local organic produce from the Basilfields Fruit and Vegetable Stand with all its produce grown just south of town in Pescadero. photo: Punta Lobo 4. Nothing is manicured. Life is too easy in the suburbs. The towns are well planned, the streets are paved with street lights, there are easy-to-follow maps, etc. But, where’s the fun in that? 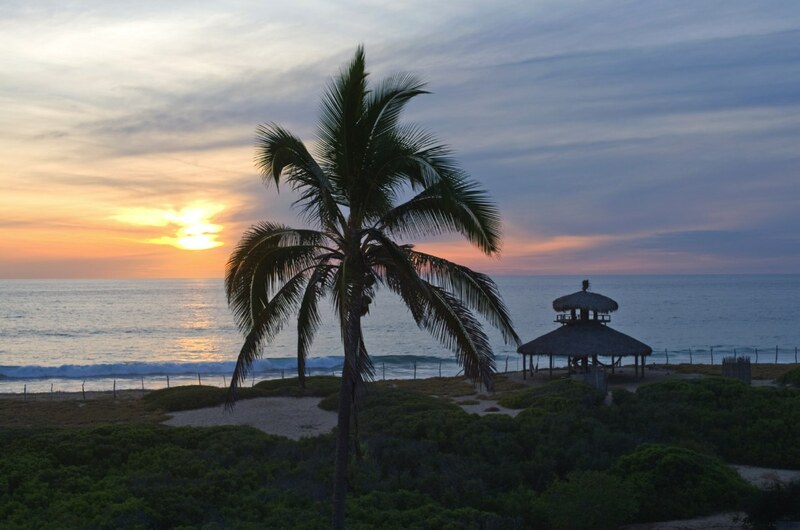 In Todos Santos, an adventurous spirit will get you everywhere. For the most part, the roads are unpaved, the walkways are uneven, and directions are given by landmarks because even if the streets have names, no one knows or uses them (i.e. to get to our house – take the dirt road, go over the cattle guard and we are five gates up). You see stray dogs, cows, and goats on the roads and you often find yourself driving next to a Mexican cowboy on horseback – this is “traffic” in our town. Your car is often more than a little dusty and you probably have dirt under your fingernails, but there is something romantic about traveling off the beaten path in Mexico and living outside the lines of typical suburban life. Jessica Canepa, a former attorney, gave up the rat race to run a "boutique-ish" bed and breakfast on the beach in Todos Santos, Mexico with her husband. Check it out at www.villasantacruzbaja.com and get the latest updates on Twitter and Facebook.